Pictured above is a glass carboy with a handle around the neck, just like the volatile combination referenced in this post. Photo from Flickr user stuttermonkey. As I type this blog post, there is not a bit of snow to be seen in East Middlebury. 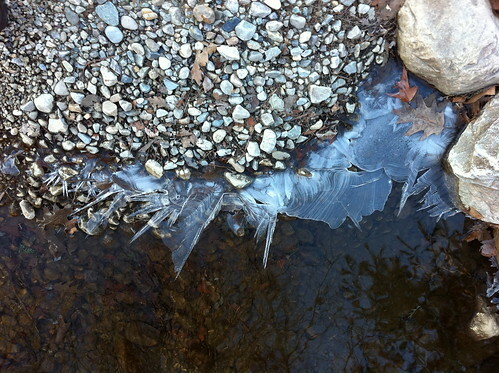 December temperatures have mostly been above average in Addison County, but over the last week, nighttime temperatures in the low 20s have caused the formation of some beautiful ice formations on local rivers and streams. Senior reporter John Flowers makes a weekly Tuesday radio appearance on Morning News Service, a program on Waterbury-based WDEV, 96.1 FM. He wraps up recent Addison County news for listeners across Vermont. It felt extremely cold outside last night. There was a light but cutting wind, the temperature was around 35 degrees, and it was raining. Persistent drizzle mixed in with occasional spitting rain. The raindrops cut like ice when they hit my face, but they were entirely liquid. I couldn’t help but wish it would cool a few degrees, so the rain would turn to snow and it would feel so much warmer. Snake Mountain has to be the most popular day-hike in Addison County. It’s an easy walk, the views are unique and expansive, and it’s only a short drive from anywhere else in our part of the Champlain Valley. On the day before Thanksgiving, I awoke to see about what I expected to see outside - a couple of inches of wet snow.